College football is pretty much upon us, and college football previews are out there in bulk. This would normally be the time where you would expect a strict look at the college football action that is set to begin. That being said, this is not a preview that is looking at the actual rosters; this is a preview that is going to take a look at some of the more interesting things that go along with College Football. This is going to be a list post, with some explanations regarding why I’ve put teams/logos/traditions/etc. into certain categories, or ranked them where I did. This is basically a different way to take a look at college football, and to (hopefully) introduce people to some of the cooler things from around the country. So (in the immortal words of Michael Bolton); boys, let’s get to it. University of Idaho: The Vandals are not only conference-less, they are also in a situation where their biggest rivals don’t play them every season in football. When Boise State left the WAC, Idaho lost annual access to a rivalry game in football; the worst part for Vandal fans was that Boise’s bi-annual trip to Moscow was also the only football rival that would play them at the Kibbie Dome. Now Vandal fans have to travel eight miles west to Pullman for the occasional game against Washington State University…a team that probably won’t ever make the trip to Moscow unless the U of I builds a shiny new outdoor stadium. We all know that the fans of Auburn like to Roll Toomer’s Corner after a Tigers’ victor, or any event worth celebrating really. It is an interesting tradition that looked like it was going to come to an end when Harvey Updyke Jr. poisoned the two oaks that dominated the corner, and the tradition of rolling the trees. Fortunately for fans of tradition, and those who support the Tigers really, Auburn University and the City of Auburn have come up with a workable solution in continuing the tradition…as well as add some cool stuff to Toomer’s Corner for future generations. “War Eagle”-Auburn University Tigers…because War Tiger Doesn’t sound cool enough apparently. “Win the Day”-University of Oregon Ducks…Until the 1980s the Ducks didn’t do much winning, but this is primarily here because of the back lash from Duck fans regarding Washington State’s advertising campaign for the Seattle Game last season. “Best in the West”(fight song)-Washington State University…On the field/Court this is laughable, but outside of athletic play this is nothing but truthiness. Washington State University and the University of Idaho: They are located in the cities of Moscow, Idaho and Pullman, Washington (which are about eight miles apart); these two cities are served by US 195, US 95, Washington State Highway 27, Washington State Highway 270/Idaho State High Way 8, and the Pullman-Moscow Regional Airport. The isolation it one of the most challenging area’s to recruit to, so when either school gets a decent recruiting class, it’s kind of surprise for their fan bases. Oh, and by the way…did I mention that the Palouse is one of the hilliest agriculture areas in the entire world? 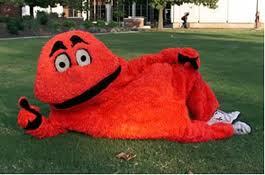 Western Kentucky University has one of the more interesting mascots, ever. It’s name is Big Red and somehow it is related to hill topping. Exactly how it relates to hill topping is something I haven’t quite figured it out yet. Whoever created it had to be high on something, and as a result Western Kentucky definitely has something that separates it from its peer institutions…. So I’m just going to leave you guys with this. Previous Previous post: Does Being A Ground Ball Pitcher Equate to Better Run Suppression?